Mark Miller’s latest book, The Heart of Leadership: Becoming a Leader People Want to Follow is a short, simple yet powerful read. It continues the story of Blake from one of Mark’s earlier books, Great Leaders Grow. But you don’t have to have read the previous book to be up to speed with what is happening in this edition. I found Mark’s tone to be conversational and warm. He’s not preachy and writes as one who is a fellow traveler on the road of leadership growth. He doesn’t talk down but instead honors his readers by pointing out road signs along the way. I resonated with one of the central themes of the book that leadership character matters more than leadership skills. As we grow deeper in character, the necessary skill mastery will come in time. It is true that we’ve seen too many highly skilled leaders derail themselves by their lack of character. Miller reminds us not to put the cart before the horse. Using the well-traveled metaphor of an iceberg, Mark asserts that 90% of leadership happens below the waterline. Then he goes to work defining the essential elements of those below the waterline traits that we need to lead well. I liked how the elements were told though a variety of people in different settings. Too often I’ve found leadership books to be too narrowly focused on marketplace leadership leaving out the arenas of non-profits, education and community groups. The effect was that we are able to see how the concepts are applicable to a myriad of situations. While the book is simple, it is not simplistic. The character traits mentioned here will take a lifetime of practice to master. This is not a bad thing because it reminds us that none of us have arrived as leaders. We’re all still learners among leaders. The element that meant the most to me was the section on responding with courage. As leaders, responding with courage is a daily occurrence as we tackle the challenges that come our way. Mark reminds us that courage takes the actions necessary to correct the situation. This is one of the best leadership books I’ve read this year. It is one that I will read again and again so that I can continue to be reminded of its principles and apply them to my leadership. Read this book and you will discover that it is not a 5 hour energy shot for your leadership skills, but rather a multi-vitamin for your leadership soul. 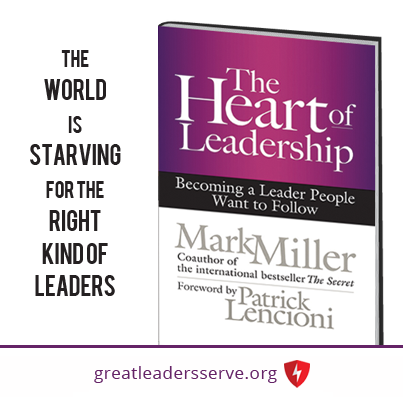 Enter to win: I am giving away 10 copies of The Heart of Leadership to my blog readers. You can enter to win by signing up to follow my blog between now and October 31, 2013. I will choose 10 winners at random. If you are already a follower, you are already entered to win! Good luck! This entry was posted in Character, Growth, Leadership, Monday Quick Tip and tagged Character, Growth, Leadership, Mark Miller, The Heart of Leadership.